Tuesday July 7th 1896 I was busy about the work all forenoon. In the afternoon I finished my mat. The boys are cutting the oats on this farm today. Wednesday July 8th 1896 I swept some and got early dinner. Will and I went to town in the afternoon and were over home awhile. Dud chores after we came home. Thursday July 9th 1896 I did the usual work and some baking. I had some little chickens hatching to look after. I got dinner early and the boys went to cut the oats on the Hanke land. I walked over thee in the afternoon and down to Mrs Murphys for a call. Did evening work. weather growing warmed. 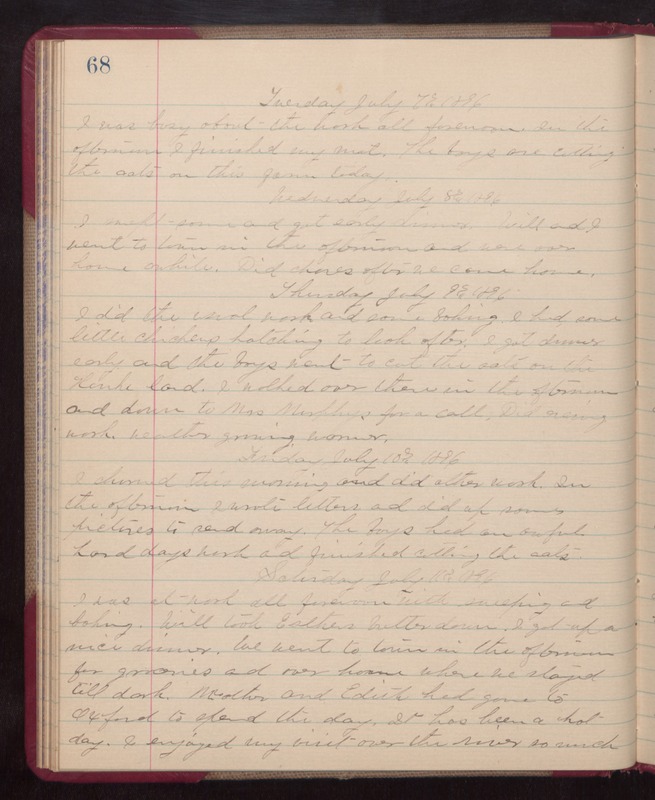 Friday July 10th 1896 I churned this morning and did other work. In the afternoon I wrote letters and did up some pictures to send away. The boys had an awful lard days work and finished cutting the oats. Saturday July 11th 1898 I was at work all forenoon with sweeping and baking. Will took Esthers butter down. I got up a \nice dinner. We wet to town in the afternoon for groceries and over home where we stayed till dark. Mother and Edith had gone to Oxford to spend the day. It has been a hot day. I enjoyed my visit over the river so much.